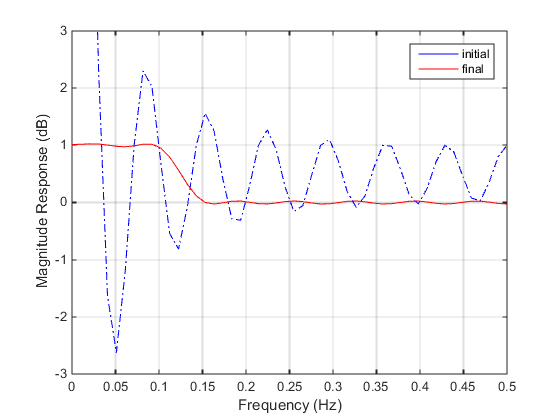 Consider designing a linear-phase Finite Impulse Response (FIR) filter. The problem is to design a lowpass filter with magnitude one at all frequencies between 0 and 0.1 Hz and magnitude zero between 0.15 and 0.5 Hz. where A(f) is the magnitude of the frequency response. One solution is to apply a goal attainment method to the magnitude of the frequency response. Given a function that computes the magnitude, fgoalattain will attempt to vary the magnitude coefficients a(n) until the magnitude response matches the desired response within some tolerance. The function that computes the magnitude response is given in filtmin.m. This function uses a, the magnitude function coefficients, and w, the discretization of the frequency domain of interest. To set up a goal attainment problem, you must specify the goal and weights for the problem. For frequencies between 0 and 0.1, the goal is one. For frequencies between 0.15 and 0.5, the goal is zero. Frequencies between 0.1 and 0.15 are not specified, so no goals or weights are needed in this range. specifies that each objective should be as near as possible to its goal value (neither greater nor less than). Compare the magnitude response computed with the initial coefficients and the final coefficients (Magnitude Response with Initial and Final Magnitude Coefficients). Note that you could use the firpm function in Signal Processing Toolbox™ software to design this filter.